Josh Leppo, a former FGCU and professional golfer, joked with friends over the years about competing in the Olympics for Trinidad and Tobago should the sport ever make it to the Games. The joke: As a U.S.-based golfer who consistently beat international opponents in tournaments, Leppo would have a tough time besting the many PGA veterans of his home country to make it onto a future Olympic team, but might stand a chance representing the small Caribbean republic. So when he met FGCU swimmer Samantha Rahael at The Pub at Mercato in Naples, it seemed funnier still when he realized Rahael was a fellow FGCU student – from Trinidad. 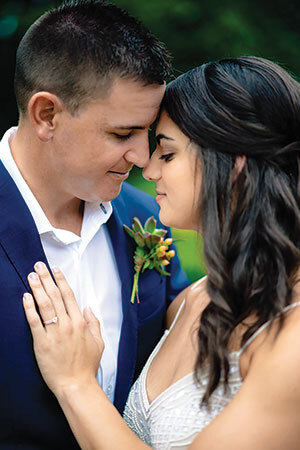 “I jokingly told her that I’d marry her,” Leppo recalls of their first conversation. Little did they both know that would become a happy reality. 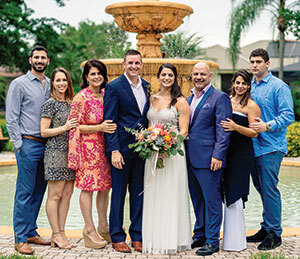 Less than two years after their fateful meeting, the couple married on Aug. 20, 2017, in front of a select group of close family with a ceremony behind the Leppo home in the Vineyards in Naples, officiated by Leppo’s best man, Eddie Rogers. Still, they knew a larger ceremony was in order. Weddings in Trinidad are a serious event; it’s typical for there to be hundreds of guests at a ceremony. Family and friends from all over the world return home, no matter which relative is tying the knot. With the family patriarch, Rahael’s grandmother, Catherine, in poor health, the couple decided to celebrate their love again, this time in front of the entire Rahael universe. 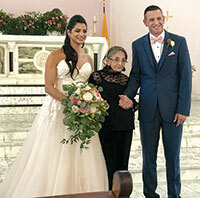 And so the couple married again in front of 250 friends and family in Port of Spain, Trinidad, on Aug. 18. Leppo (’12, Communication) and Rahael (’16, Resort & Hospitality) meshed well as fellow FGCU athletes and alumni. Leppo was a big fan of school athletics and enjoyed checking out many of Rahael’s swimming and diving meets. The two FGCU alumni are thriving in their professional lives as well. Following several years pursuing professional golf overseas, Leppo returned home and is now a financial advisor with Wells Fargo Advisors. Rahael retired from swimming and now helps run a local catering company in Southwest Florida called Tastebuds. Despite their professional success and collegiate athlete credentials, neither has plans to compete in the Olympics for Trinidad & Tobago any time soon.